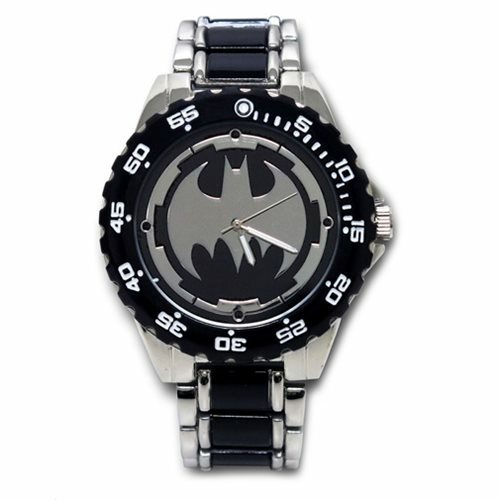 Stylish Batman Logo Watch shows that you're a fan of the Caped Crusader! Black and silver Batman-themed design. Japanese quartz movement and a bracelet-style band. Even a rich snob like Bruce Wayne can appreciate this! You'll always know what time it is with a little help from Batman. This Batman Logo Watch with Black Metal Bracelet Band has a cool and elegant black and silver Batman-themed design that even a rich snob like Bruce Wayne can appreciate! With a Japanese quartz movement and a bracelet-style band, you'll check the time over and over again while this bad boy sits stylishly on your wrist. The face of the watch measures about 1 1/4-inches in diameter. The Batman logo is large on the face, so there will be no mistaking that you're a fan of the Caped Crusader!